This past Saturday (March 23, 2019) was the fourth time I've seen Gilbert Varga conduct the St. Louis Symphony Orchestra and, once again, I came away impressed with the combination of high drama and pinpoint precision he brings to his interpretations. The last time I saw Mr. Varga in action, it was with an all-Russian program in 2016. This time the music was French, but the performances were every bit as compelling, beginning with a pristine romp through Dukas's popular "The Sorcerer's Apprentice." Conducting without a score, Mr. Varga treated the audience to a beautifully detailed and vibrant performance that reminded me once again of just what an effective piece of musical comedy this little tone poem is. Individual orchestral details were finely wrought, including the growling voice of the animated broom in Andrew Cuneo's bassoon section and the dramatic proclamations from Thomas Jöstlein's horns. It may be that, as Paul Schiavo writes in his program notes, the work has become "simply the soundtrack to a clever cartoon" because of the expert job Disney's people did animating it back in 1937, but it's still a delight to hear even if it's hard to banish visions of Mickey Mouse from your head. 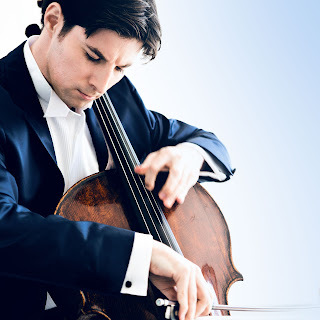 Up next was Édouard Lalo's Cello Concerto in D minor, written in 1876 for the Belgian cellist Adolphe Fischer, who premiered it the following year. It's a colorful piece with a strong Iberian influence in the final movement and a strong sense of drama throughout. Soloist Daniel Müller-Schott, who has been praised in the past for his big tone and clear-cut articulation, demonstrated exactly those qualities in a focused and committed performance. The first movement had all the gravitas it required while the second was perfectly light and fleet, with nice work from Andrea Kaplan and Jennifer Nichtman in the prancing second theme. The soulful opening of the final movement was as dark and intense as it should be, while the ensuing Allegro vivace bristled with flash and fire. That made for a nice contrast with the encore that followed: a solo cello version of Ravel's haunting (but no less technically challenging) "Pièce en forme de Habanera." The concert closed with a highly charged performance of the Symphony in D minor by César Franck. Written in 1888, when the composer was in his 60s, it's a dramatic work with a dark, urgent first movement, a richly romantic second with a justly famous English horn solo, and a blazing, powerful finale. It's also a work that can be episodic and even ponderous. Mr. Varga's interpretation, with its retards and pauses, could have come across that way but didn't. Instead he allowed the rich variety of this music to come through while still maintaining a sense of dramatic tension. Particularly in the first movement, individual phrases emerged with great clarity and the performance overall was immensely gratifying. It was also exceptionally well played. Notable moments included Cally Banham's English horn solo and Allegra Lilly's graceful harp in the second movement, the robust tone of the strings, and powerful work by Roger Kaza's horns. I was also reminded of how some orchestral details, like Tzuying Huang's solid bass clarinet, can only be appreciated in live performance. Mr. Varga's dynamic style on the podium was also something that could only be fully appreciated in person. This was especially true when he was conducting without a score. It was delightful to see him leaning into the strings to coax out a phrase or leaping back and forth to highlight individual phrases. Mr. Varga seems to have a very personal and visceral relationship with the orchestra, and they seem to take great pleasure in playing for him. Next at Powell Hall: Jakub Hrusa conducts the St. Louis Symphony Orchestra, along with violinist Karen Gomyo, Friday and Saturday at 8 pm and Sunday at 3 pm, March 29-31. The program consists of a suite from Bartok's' ballet "The Miraculous Mandarin," Tchaikovsky's Violin Concerto, and Shostakovich's Symphony No. 9.